A few months ago I posted a series 'HIIT with a BITT'. 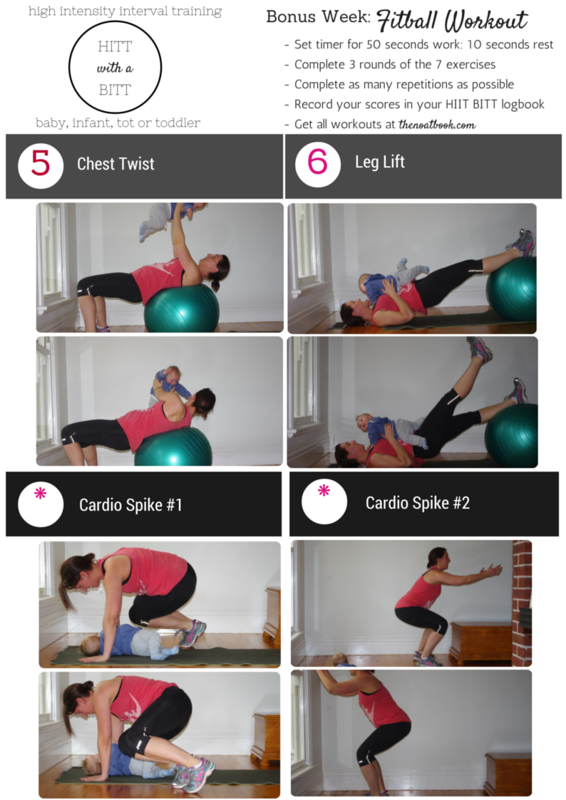 It was an 8 week series that provided you with high intensity interval workouts that you could do at home with your baby with no equipment. It's also great for interactive tummy time for your baby. And if you don't have a baby, just use a weight (a dumbbell, brick, bag of sand) instead! 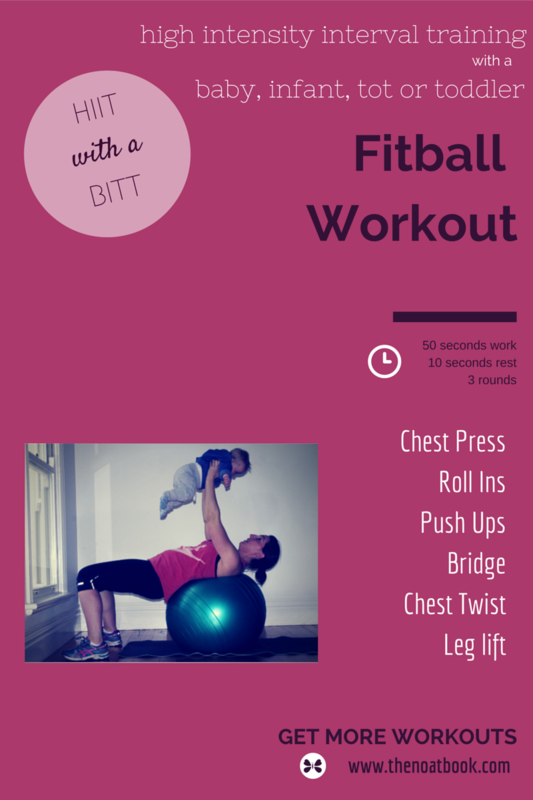 This week I've added a bonus workout that does require one piece of equipment that many people have access to, an exercise ball (They are also known as a fitball, swiss ball, physio ball etc). You can find all of the original workouts on my Workout tab above or by following the links below. Add the cardio spike exercises (2 foot side jumps and 180 degree surfer jumps) in between each exercise to really get your heart rate going. 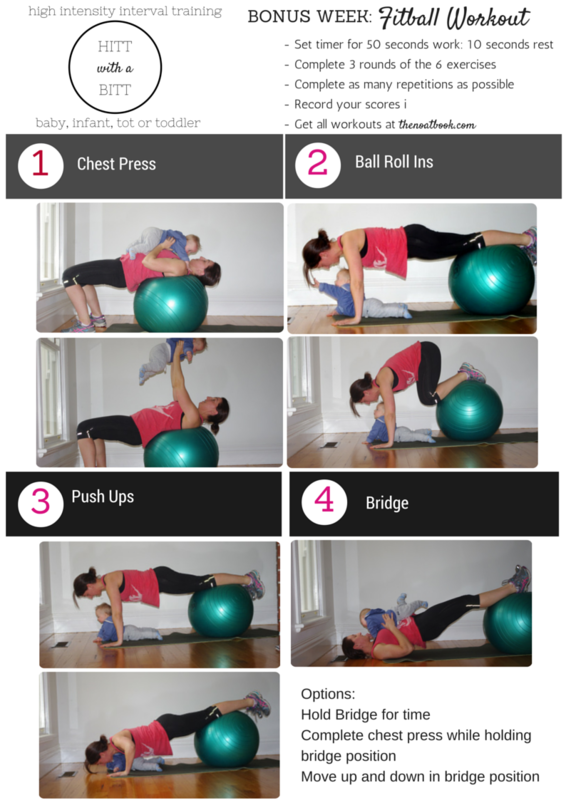 If your bub is a bit heavy for the chest press, bend your elbows. The closer the ball is to your feet the harder the push up. Looking back at the photos shows me how much JJ has grown. He is now 15 months old and is running around the place, happy to occupy himself by pulling everything out of my cupboards and drawers while I do my workouts. He will toddle over and try to sit on me for some of the exercises and at around 12kg he adds quite a nice load!! Argh - the Internet keeps eating my comment. Third time lucky (I hope!). This is great. I know I had one of these balls but it has mysteriously disappeared and I have no idea where it went. How on earth did I lose it?! Doing the ball roll ins and push ups with a baby underneath would guarantee that I'd develop stronger muscles faster as I couldn't collapse down when tired as I tend to do at the gym!!! LOL, it does add an extra layer of accoutability! Thanks for checking it out.